It’ll be a fine day for Evian, when Mars is finally colonised: bottled’s the only option, when you’re living on a planet whose last substantial traces of flowing liquid water disappeared a few billion years ago. That ancient water has occasioned much study and debate, and provided the name for at least one French-Candian psych rock band. The fact that it existed, at one point, is a large part of why dreams of annexing Mars have flourished. But where did it go, exactly? By what majestic geological processes do massive bodies of space-liquid just disappear? For this week’s Giz Asks, we talked to a number of Mars experts to find out. As a geophysicist who spends a lot of time thinking about subduction zones on Earth, I’m even more surprised than most people by the disappearance of water from the surface of Mars. Here’s why. On Earth, water reacts with rocks on and below the ocean floor. Those water-altered rocks are carried into subduction zones by the motion of tectonic plates. This moves 150-300 metric tons of water a year from the surface to the interior of the Earth – a pretty efficient way to remove water from the surface. That mechanism doesn’t work on Mars because there is no plate tectonics or subduction. The orbiters and robots that we have sent to Mars have identified rocks and minerals that formed in the presence of water, including some of the same minerals and rocks found on Earth’s ocean floor. We know that some of these rocks and minerals only form at pressures and temperatures deep below the surface of Mars; water must have been present deep below the surface. As a participating scientist on the InSight mission, I am calculating densities and seismic properties for likely compositions of the Martian surface rocks in order to identify signatures of water-altered rock that can be detected by seismic waves. Data from the InSight mission could place limits on how much water might be hidden in plain sight – within the altered rocks we have observed. Mars has changed significantly in the 4.6 billion years since its formation. About 3.8 billion years ago, Mars was much more Earth-like, with volcanism, a magnetic field, water on the surface and a thick atmosphere – at a time when life was starting on Earth. The evidence for ancient water on the surface has been building up – starting with orbiter imaging from Viking, in-situ direct evidence that water was on the surface with mineral analysis from Opportunity and Curiosity, evidence for neutral acidity water from Curiosity, and water-rich minerals and clays on the older surface regions, mapped by Mars Express. All this shows that water has been and still is present on Mars – but some of the water went underground and some escaped to space as seen by Mars Express and Maven. 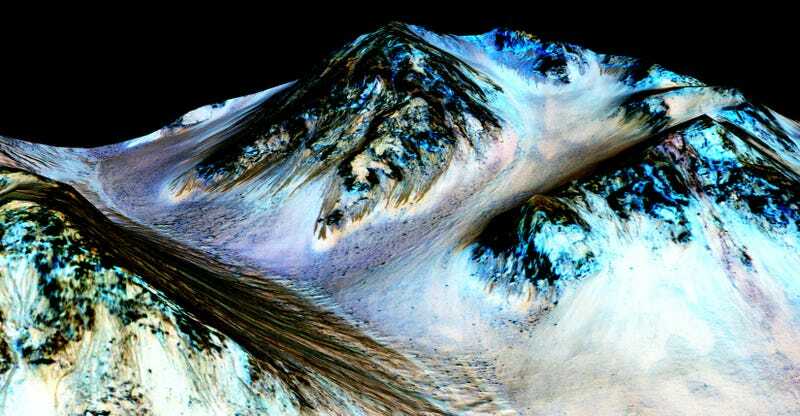 But the potential for life on Mars was best 3.8 billion years ago. That’s why with the ESA-Russia Rosalind Franklin (ExoMars) rover we’ll be drilling up to 2m underneath the harsh Martian surface to search for signs of past, or less likely present, life in-situ. Also, Mars 2020 will gather samples for an eventual Mars sample return. 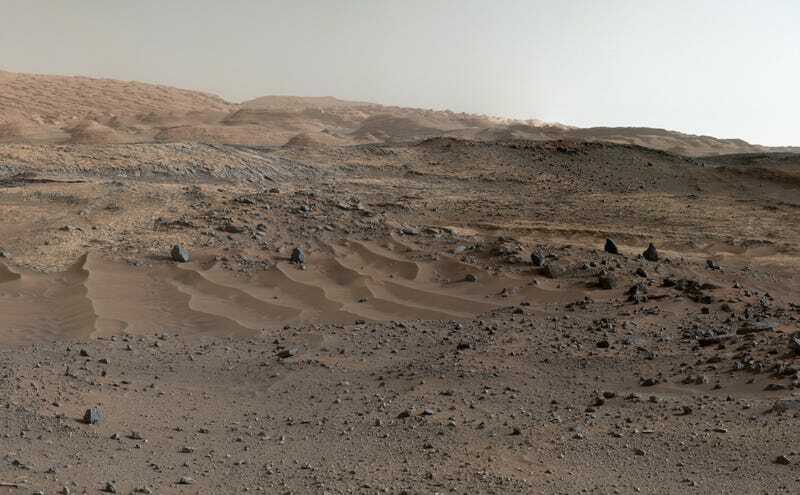 In total, the evidence (in the current atmosphere) appears to suggest that Mars lost 10 per cent to 30 per cent of the water it had four billion years ago. Of the remaining 70 per cent to 90 per cent of its water inventory, no more than five per cent to 10 per cent of that water has been found in the polar caps. The remaining water, perhaps as much as 90% of the water Mars started with, is in underground reservoirs. We even have movies of briny water flowing today on the surface of Mars, where it is warmest near the equator in the middle of the day. This was confirmed by spectroscopy, which found the signal of hydrated salts – very dilute milk of magnesia! – right where these damp flows appear, and not where they do not. But otherwise, where is all the surface water on Mars? Evidence for liquid water on ancient Mars is seen in the morphology of the surface – features that look like runoff channels for surface water, lakes that filled ancient closed basins created by impact craters, a general degradation of the surface that is most consistent with the presence of an active hydrological cycle, and flow features that suggest the occurrence of large-scale flooding. More controversial are features like “gullies” and flow-like features termed “recurring slope lineae” that may be due to recent water or may be caused by dry flow. And radar has detected what appears to be a wet layer about a kilometre beneath the surface near the south pole that may involve a buried groundwater layer. Another issue is that Mars lost its magnetic field relatively early due to its relatively small size. This results in solar wind hitting the atmosphere, ionising it, and then blasting off free protons or molecular hydrogen gas, and even water vapour as a molecular cloud. The MAVEN mission is studying this interaction currently.